The favourite residence of Henry VIII, Hampton Court Palace is likely to be one of your favourites too! The magnificent palace was developed by Cardinal Wolsey, and continued to grow from monarch to monarch, with Henry VIII being the most prolific resident, and Sir Christopher Wren being responsible for the design of the east and south facades of the palace, under the direction of William III. 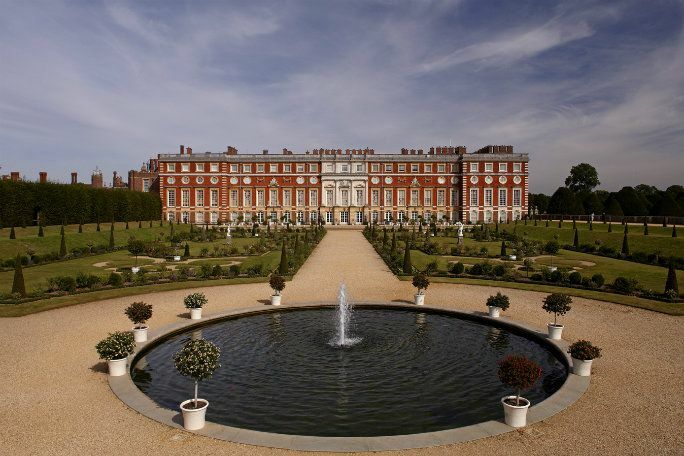 Sir Christopher Wren’s elegant baroque exteriors dominate the breath-taking 60 acres of formal gardens, which have recently been restored, and of course the world-famous Hampton Court Palace maze! 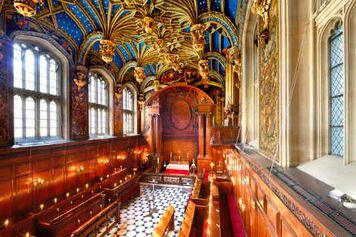 On your trip, find yourself immersed in the sounds and sights of the Base Court, and marvel at the grandeur of the State Rooms, decorated during Henry VIII’s reign. 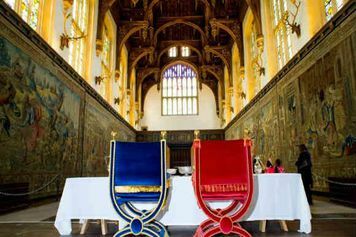 The must-see destination of your trip is the vast Tudor Kitchens, where you’ll tickle your taste buds in this living monument to over 230 years of the culinary delights that have placated the Royals. Designed to be able to feed at least 600 people every day, two meals per person, the kitchens are a sight to be seen and are still regularly used to cater meals in the style of a Tudor menu. The Haunted Gallery is a treat for the ghost-hunters amongst you, and the adjoining palace, the Baroque Palace, invites visitors to discover the gossip and intrigue from other historical periods, including the Georgian and Stuart eras. Included with your ticket are excellent audio guides, and costumed tours and talks occur daily at the palace to make your visit fit for a King. A multitude of seasonal events take place throughout the year – please check the calendar for further information and dates. A grand lavishly laid out collection of state apartments built by the new monarchs. Walk through the rooms of this elegant part of the Palace and imagine the beautifully dressed courtiers revelling in the politics and gossip of court life. This is the best place to view the magnificent King’s Privy Garden. Walk in the footsteps of England’s most famous King and his six wives. Lavishly presented the apartments include Henry’s Great Hall, the Great Watching Chamber, the Great Council Chamber and the processional route, allegedly haunted by Catherine Howard, Henry’s fifth wife. Privy Garden – The Privy Garden is one of the most accurately reconstructed gardens at Hampton Court because so much was recorded about the original 1702 garden. The beautiful geometry of the garden seen against the stunning palace façade is a site not to be missed. The Great Vine – Planted by Lancelot Capability Brown in 1768, this is the oldest vine in the world. See the many bunches of grapes develop through the Summer ready for harvest late August, early September. The Magic Garden – This exciting garden is a self-contained family focussed walled area with every feature designed to be climbed upon, including a jousting arena, five tiltyard towers and a fire breathing dragon. With a focus to engage children and families in history, this amazing, larger than life outdoor attraction is a perfect addition. Mantegna’s Triumphs of Caesar FROM JUNE 2018 – Brought to England by King Charles I these spectacular frescoes have been at Hampton Court Palace since 1630. Young Henry VIII’s Story – Meet the pip-up Prince – explore the relationship between Henry and his first wife, Katherine of Aragon and Cardinal Wolsey with some spectacular Tudor paintings from the Royal Collection. Cumberland Art Gallery – Formerly an apartment belonging to the Duke of Cumberland the new ‘art’ rooms are the home to masterpieces from the Royal Collection. Groups can discover the stories behind the artworks so avidly collected by the 17th and 18th century monarchs. Georgian Kitchen Garden – See how the fruit, flowers and vegetables were planted, tended and harvested for the king’s table in the 18th Century in this enormous garden, full of produce. Newly opened in Summer 2014 this garden demonstrates the vast array of fruit and vegetables enjoyed by the royal court at the palace. The Maze – Commissioned around 1700 by William III, this large and complex maze is one of the oldest surviving hedge mazes in the country and covers a third of an acre – make sure you have your wits about you to brave it! Please note that on Tuesday, 11th June Hampton Court Palace will close at the earlier time of 3.00pm. 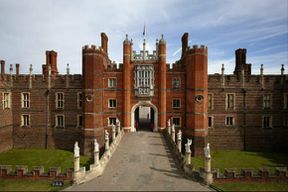 Please take your voucher/confirmation to the Group Ticket Window along with photo ID for fast entrance to Hampton Court Palace. Audio Guides: Available free of charge in English, French, German, Italian, Spanish, Dutch, Japanese, Russian and Korean, audio guides can be collected from the Information Centre in Base Court. Disabled Access : Hampton Court Palace is a historic building and, therefore, has uneven surfaces. However, many of the staircases are wide and shallow (having been built for William III who was asthmatic). Most of the routes within the palace are accessible to visitors unable to climb stairs as there is a lift to take visitors to the State Apartments on the first floor. Please ask a warder for assistance. However, for evacuation reasons, only six wheelchairs are permitted on the first floor at any one time. As a consequence, visitors may occasionally have to wait or visit an alternative part of the palace. Manual wheelchairs are available for use within the palace. Wheelchairs are available on a first come, first served basis and cannot be booked in advance. Please ask a warder for assistance. Single-person scooters are available for use in the gardens only, again on a first come, first served basis and they cannot be booked in advance. General audio tours for visitors with visual impairments are available for: King's Apartments of William III Georgian Rooms Tudor Kitchens The Young Henry VIII exhibition. Braille guidebooks are available free, on loan, from the Information Centre in Clock Court. Braille and large print folders are available in the Young Henry VIII exhibition. Please ask a warder if you wish to use them. The artefacts in the Tudor Kitchens may be handled as they are replicas. Agents bringing child students or children to the palaces must provide a ratio of 1 adult for up to maximum 15 child/students children. If bringing children and students booked through the Learning and Engagement department, the ratio must be 1 adult to 60 children or 1 adult to 10 students.